polyols (artificial sweeteners containing isomalt, mannitol, sorbitol, xylitol, and fruits with stones like avocados and apricots). Originally, the diet came from a group of researchers looking for a way to help people suffering from either Irritable Bowel Syndrome (IBS) or Functional Gastrointestinal Disorders (FGIDs). They developed a theory that IBS and FGIDs may come from consuming certain foods that are poorly absorbed in the small intestines. Poor digestion allows time for FODMAPs to be fermented upon by gastrointestinal bacteria and produce hydrogen and methane in the gut. Why Should You Try the FODMAP Diet? If you experience the symptoms of either IBS or FGIDs, such as: excessive gas, bloating, distension, abdominal pain, diarrhea or constipation you may want to use the FODMAP diet. (Have a professional medical practitioner’s diagnosis if you suspect you have IBS or a FGID.) The Low FODMAP diet is filled with high fiber and high natural, prebiotic foods. The basic idea is to reduce gas causing foods, such as the short-chain carbohydrates that are poorly digested in the small intestines. The Low FODMAP foods will also help develop the growth of beneficial bacteria in the gut. It’s not usually a permanent diet solution. Normally, it’s used to try to reduce symptoms of IBS or an FGID by use for two to six weeks and then gradually re-introducing small amounts of individual foods back into your diet. Jams and jellies without HFCS, dark chocolate, pickles, salsa, most spices and herbs, homemade broths, butter, chives, cooking oils, mustard, margarine, mayonnaise, onion (spring-green part), olives, pepper, salt, seeds (chia, flax, pumpkin, sesame, sunflower), sugar, soy sauce, vinegar. Chutney, jams and jellies made with HFCS, agave, garlic, garlic salts and powders, honey, molasses with HFCS, onion salts and powders, salsa, tomato paste. A Sample Menu Based on the Foods Recommended on a Low FODMAP Diet List Include 6-8 glasses of water every day. Breakfast: Omelet with cheddar cheese, bell peppers, spinach, olives and tomatoes, gluten-free toast with lactose free spread, coffee. Lunch: Sandwich made with gluten-free bread, turkey (no HFCS), swiss cheese, alfalfa sprouts, HCFS-free mayonnaise and mustard. Corn chips, snack, sunflower, seedsGlass of lemonade. Dinner: Roast beef, potatoes baked with salt and rosemary, salad made with lettuce and tomatoes and no HFCS balsalmic vinegar dressing, a glass of weak peppermint tea. Breakfast: Smoothie made with banana, frozen strawberries, flax seeds and almond milk, green tea. Lunch: Sandwich made with gluten-free bread, leftover roast beef, swiss cheese, mayonnaise and alfalfa sprouts, gluten-free crackers, snack, cantaloupe, glass of lemonade. Dinner: Baked chicken cooked with the spring-green part of an onion, sunflower seed cooking oil, salt, pepper and topped with a HCFS sauce to serve, brown rice, steamed green beans with sliced almonds. Breakfast: Oatmeal with blueberries and brown sugar, coffee. Lunch: Leftover baked chicken, salad made with spinach, tomatoes, mandarin oranges and a raspberry (HCFS free), vinaigrette, gluten free crackers, snack, sunflower seeds, glass of limeade. Dinner: Pork stir-fry made with cabbage, carrots, water chestnuts, bamboo shoots and green beans, brown rice, peppermint tea. Breakfast: Smoothie made with banana, frozen blueberries, chia seeds and almond milk, coffee. Lunch: Salad made with spinach, tomatoes, almond slices, tuna, and a raspberry (HCFS free) vinaigrette, snack. Lactose-free yogurt with strawberries, cup of weak black tea. Dinner: Beef stew made with allowed foods, i.e. parsnips (no tomato paste or onions). Breakfast: Oatmeal with banana slices, almond milk and brown sugar, coffee. Lunch: Sandwich made with gluten-free bread, turkey (no HFCS), swiss cheese, alfalfa sprouts, HFCS-free, mayonnaise and mustard, snack, cantaloupe, limeade. Dinner: Chicken adobo made with none of the foods to avoid, gluten-free chips, salsa made with tomatoes, onion, greens, parsley and limes, cup of peppermint tea. Breakfast: Smoothie made with banana, frozen strawberries, flax seeds and almond milk, cup of coffee. Lunch: Gluten-free chips with melted cheddar cheese, diced tomatoes, bell peppers and olives, snack, leftover gluten-free chips and salsa, limeade. Dinner: Pan-fried shrimp cooked in sunflower oil, topped with lemon, brown rice, stir fry vegetables: carrots, cabbage, green beans, and bean sprouts. Breakfast: Gluten-free waffles covered with blueberries and maple syrup (made with no HFCS), cup of coffee. Lunch: Salad made with lettuce, bell pepper, tomato, alfalfa sprouts and topped with HFCS-free dressing, snack, lactose-free yogurt with strawberries, cup of weak black tea. Dinner: Baked ham slices topped with pineapple chunks, potatoes baked in sunflower seed oil, salt, and rosemary leaves, baked green beans topped with almond slices. If you choose to follow the Low FODMAP diet, do yourself a favor by starting out fresh. Clear your pantry out of all the foods to avoid. Read food labels for HFCS. If a food to avoid is listed at the end of an ingredient list, it can be used in moderation. Although this is not a gluten-free diet, gluten-free products so not have wheat, barley or rye in them. If you experience constipation, try eating oatmeal. Looking for More Low-FODMAP Meals? 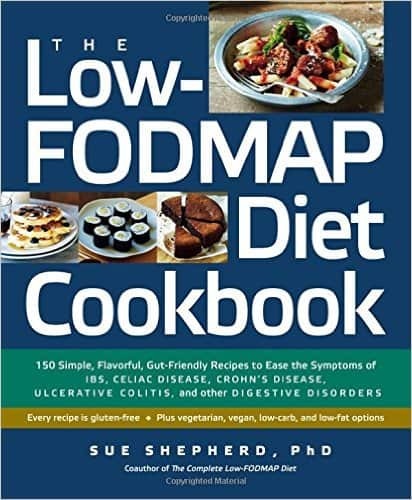 Take a look at the book, The Low-FODMAP Diet Cookbook: 150 Simple, Flavorful, Gut-Friendly Recipes to Ease the Symptoms of IBS. Thank you for your information. I will print it out right now. I am a 38-year-old male who has been suffering from IBS symptoms for at least the past four years. It started out with abnormally large, soft and frequent bowl movements between 2012 and 2013. By the beginning of 2014, I began experiencing severe lower back pain, and chronic abdominal bloating had become my chief complaint. I’ve been seeing a well-acclaimed G.I. doctor for the past three years, but for me he hasn’t accomplished anything but prescribe various medications which haven’t worked. His most recent recommendation was to investigate and begin a low FODMAP diet, which is where I am now. I suffered from severe anxiety when I was a kid, and mental illness runs in my family. I’ve been an elementary school teacher for the past eleven years which brings a very stressfull lifestyle. I’m currently in the process of leaving my career to pursue graduate school for counseling. I’m hoping that I will now have the time to thoroughly investigate special diets as they relate to my intestinal disorder, and alleviate the chronic stress I’ve endured for more than the past decade. Not the strictest form. That is a elimination diet to help you identify triggers. Once you know what they are, you can expand your diet to offer more variety. I have been seeing GI doctor after GI doctor for 5 years and no one knows what is wrong. I am now going to the Cleveland Clinic. I have had every test they can do and the doctors are at their witts end, as am I. I had my gallbladder out and then I had a pyloroplasty which didn’t help with the diarrhea. Everyday, all day. Its horrible. I am going to try this FODMAP and see if this helps at all. Did they check your bile salts adsorption? Just as an FYI… all the research on this has been done, in Australia, at Monash University in Melbourne. While I see many hospitals here, in the U.S., recommending the FODMAP diet, it was not until I happened upon the Monash site, did I see the extent of the research and also extra information which seems to fall off the list, here. I would recommendation taking the time, to educate yourself further because you may find answers to questions, not being asked over here. Just a thought. I have bile acid malabsorption ….same ussue as you. I now use Questran powder…amazing instant relief from pain and dreadful gastric . I can now travel and even get on a train. Monash/Australia sites are the most dependable. USA ‘experts’ are just not. Monash continues to perform great research/results. Soy from USA is a no for me – sprayed!! Ask your doctor about questran powder….changed my life. Have your doctor test you for SIBO. I have been suffering for 14years and after a surgery that went bad I was antibiotics for three months which made things worse. I recently came upon an article in Woman’s Day Magazine and after reading the systems the writer was experiencing I insisted that my doctor perform the same test. As of 9/19/16 the test was positive with a grossly amount of bacterial overgrowth. I am to see the dietician and start on antibiotics and probiotics to ease/eliminate the symptoms. I noticed a discrepancy: Foods recommended have soy milk from soy protein but foods to limit/avoid have soy milk from soy bean. How is this different? All soy begins as a bean. Secondly – foods recommended – grains have ‘spelt grains’ and lists gluten free grains. Spelt is a cousin of the wheat family and is considered a glutenous grain therefore spelt has nothing in common with the gluten free grains listed. Why include Ham and bacon. Both are full of nitrates, sulfites and other junk. As far as I’m concerned I will not eat pork because of the horrible way in which those poor hogs are raised. Be mindful of how the animal was treated, because it affects the meat. Different issue. This diet is not vegan or vegetarian, but is based on science around digestion of FODMAPs. You can seek out organic sources, but restricting your diet too much can have other health consequences when you are low on essential nutrients. It’s tough to be vegan or vegetarian if you have IBS. My husband was recently placed on a low fodmap diet and this site with all its information, menus, etc. has been a wonderful help! Any oils are okay. Oil, coconut, soybean, sunflower.. Caution: many add sulfer to ‘cage free & free range’ feed for the chickens as these terms are Very misleading! Sulfer helps to keep chickens somewhat healthy when compacted in small areas – sulfer makes many people very sick, like me. Try just an egg at a place you like to eat to test… I live in a town/city that permits me to raise 6 chickens, more eggs than I can eat. 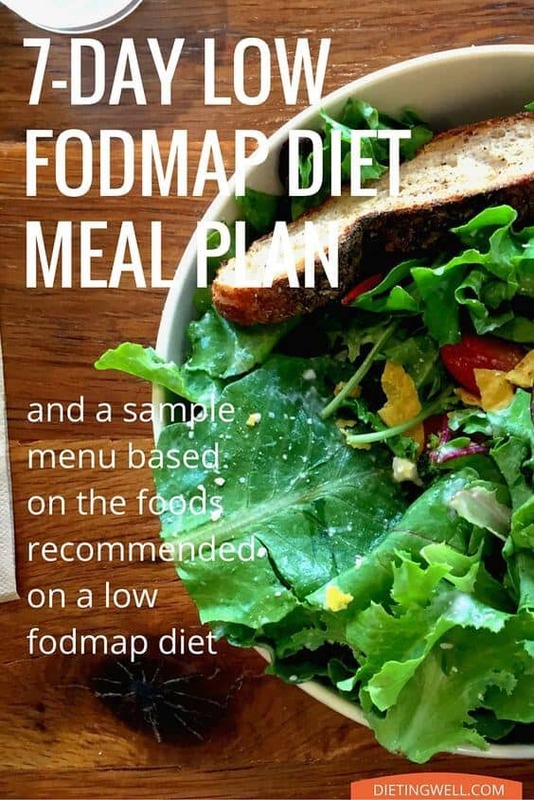 i recently discovered the FODMAP diet for my IBS symptoms and it has worked beautifully to get rid of the bloat, abs pain and frequent trips to the bathroom. thank god this works for me. it was an instantaneous turn around. i got rid of all the do not eat foods and limit the ingredients on plate. very grateful this works. Like many, this info is lifesaving, thank you. I had followed low FODMAP, but must have gone off with holidays for now I am not going to the bathroom at all. 2 x in 7 days. It must be fiber. My Dr says no problems unless pain. No pain, but no movements. I find myself eating the foods that give me diarrhea, but still nothing. Ive eaten more oatmeal in 3 months than 20 years!I had successfully taken chia in water daily but it’s not helping now. I’m back to fiber therapy, but after a week still no change. Fingers crossed this eating plan will get my fiber up and moving! there are a lot of conflicting Foods to eat and not eat. One I read said no salt or pepper or spices. Was awful to stop using garlic and Onions – I always cooked with them. Food is rather bland now. Then I read an article that says you can use salt and pepper and dried herbs. Soooo who do I follow and believe?